Here's a list of skills for all central line heroes in the action RPG multiplayer online battle arena (MOBA) game - Heroes Charge. Central line Heroes specializes in long ranged combat and are very powerful due to their high damage per second (DPS) and control skills. - Coming Soon! Suggestions are Welcomed! - Phantom Stab: Wu Kong summons a phantom of himself and damages enemies ahead of him with multiple stabs. - Doppelganger: Wu Kong summons two of his doppelgangers to fight for him. - Frost Lance: Wu Kong throws a frost lance at a target, causing physical damage to it and slowing it down. A phantom is also created attacking the target. 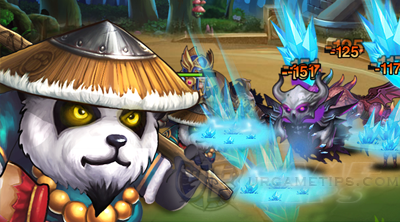 - Phantom Boost: Wu Kong increases the HP of his phantoms and his own. - Dark Territory: Terrence reduces enemies' attack accuracy and deals magic damage to them. - Life Sacrifice: Terrence sacrifices his own HP to increase the whole team's physical attack damage for a period of time. - Souls Exchange: Terrence restores his own HP to the max, at the cost of some HP for a random ally. The ally will not die from this skill. - Rebirth: When Terrence's HP reaches zero, he steals allies' HP and restores his own so that he can continue to fight for a period of time (He dies when the time is over or when his HP reaches zero again.). - Summon Wraiths: Rasha calls forth a group of angry wraiths to cause magic damage and steal the life force of her enemies for her. - Swarm of Bats: Rasha summons a swarm of bats and deals magic damage to enemies in front of her. - Silence: Rasha silences a wide area of enemies and disables their spells casting. - Sinister Aspect: Rasha embraces her diabolical nature, increasing her own magic power. - Auncel: Bane summons an auncel and deals damage to the enemy of most HP. The amount of damage is based on the missing HP of Bane. - Holy Snake: Bane releases a holy snake to attack the enemies nearby, dealing physical damage. Holy Snake’s level is X. - Finger of Death: Bane deals magic damage to the enemy of least HP. If the enemy dies, Bane deals bonus damage next time he casts this skill. - God of Desert: Bane increases his max HP by the force of the Desert God. - Hellfire Giant: Tannok calls forth a hellfire giant down from the sky, stunning nearby enemies and causing magic damage. The hellfire giant fights for Tannok until death or end of the battle. - Incantation: Tannok uses an incantation towards the weakest target, restoring HP if the target is an ally, or causing magic damage if the target is an enemy. - Fist of Flame: Tannok controls hellfire giant to bash and stun an enemy with a fist of flame. - Emberstorm: Eva calls down elemental magic to damage one of her enemies. - The Crucible: Eva summons a blast of flames, causing magic damage to enemies in a wide range before her. - Caldera of Ash: A circle of flames rises around a random enemy, causing magic damage and stunning the target. - Phoenix Feather: Eva's mastery of ember increases her energy every time she attacks. - Tortured Spirit: Shalandar releases hungry ghosts that deal magic damage over a broad area. This skill will also be triggered automatically upon Shalandar's death. - Shades: A vengeful shade deals magic damage over small, moderate and ranged areas. - Mastery of Death: Ferryman increases his attack damage every time a Hero dies. The effect of Skill Shades will also be increased. - Haunting of Dark Lord: Ferryman terrifies all enemies nearby and greatly reduces their attack damage. - Pulse Nova: Summons a Pulse Nova every second to continuously damage nearby enemies. - Lightning Storm: Calls a lightning storm that jumps and hits nearby enemies. - Diabolic Blast: Saturates the area with magic, causing random explosive damage to nearby enemies. - Split Earth: Splits the earth under enemies' feet. Deals damage and stuns for a short duration. - Ice Halo: A ring of icy frost is brought to bear against Helga's targets, it bounces between them, dealing additional magic damage. - Force Blast: A target zone is struck with a powerful blast of supercooled air, causing magic damage over a small area. - Bag of Holding: Helga summons frost armor for her weakest ally, enhancing their armor for a period of time. - Terrible Presence: Helga terrifies all her enemies, reducing their magic resistance. - Insidious: Quimulan assassinates a target with holy damage and deals splash damage near the target. - Refraction: Each time Quimulan kills an enemy, she gains 5 refraction charges, each of which absorbs one incoming attack and recovers 80 energy. The refraction also blocks all control skills. - Psionic Magic: Quimulan creates a psionic trap on ground and controls enemies within to disable them from moving, dodging and attacking. - Spectral Blade: Using her psionic powers, Quimulan deals holy damage to her target and causes enemies behind the target to feel the same pain as the target itself. - Hunting the Maiden: A powerful elemental storm comes down causing widespread magic damage over time. - Cocoon of Ice: Artonia freezes a target in place, causing magic damage and stunning them. - Ice Prison: A blast of ice slows enemies within an area and deals magic damage. - Sigil of Arctus: Using this ancient ward, Artonia and her allies slowly recover their energy. - Cold Shield: Keld protects all allies with a cold shield, resisting magic damage. - Disarm: Keld freeze and stuns an enemy target, dealing magic damage. - Mute: Keld silences the enemies who have dealt magic damage to him during the first 15 seconds of the battle. - Last Words: Keld silences all enemies upon his death. - Smite: A blaze of energy strikes a target, dealing massive magical damage. - Thorn: Lodot summons a thorn that knocks the victim into the sky, dealing a small amount collateral magic damage. - Power Strike: A powerful magic against a single target and turns it into an animal. - Uncanny Edge: Lodot makes a pact with demonic forces to increase his Magic Crit. - Lightning Bolt: A rolling thunder causes magic damage to all enemies. - Conductivity: DeTheta uses his magic lightning power to beat many of his foes at once. - Overload: DeTheta selects a single target, striking them with a lightning bolt for massive damage. - Electrostatic Field: DeTheta's power increases, giving him a bonus to magic power. - Lunar Barrage: Summons the power of Boaz, striking random enemies with beams of powerful lunar energy and dealing magic damage. - Lunar Judgment: Summons the power of Jachin, striking a target with lunar rays and dealing magic damage. - Moonblade: Loreth throws a lunar blade that bounces around between enemies and causes more physical damage, losing a small amount of power with each bounce. - Chosen of Boaz: Loreth grants the lunar blessing on her allies, increasing their physical attack damage. - Overcharge: Lirune over-charges his weaponry capacitors, causing his machine to unleash a barrage of attacks and deal AoE damage. - Charged Shot: Lirune fires a magical beam weapon to damage and blind his target and reduce target's physical attack accuracy. - Seeker: A missile that seeks out a random target and explodes, dealing magic damage over a small radius. - The Red Button: Lirune presses the red button, greatly increasing his attack and casting speed. - Sunsphere: Fiera releases powerful magics among her foes, damaging those who rely on their strength and agility. - Fireball: Fiera attacks a foe with a ball of raw magical energy and deals massive magic damage. - Black Mark: Fiera chooses a random enemy to exile from the battle for a period of time. - Third Eye: Fiera pulls energy out of space, expanding her intellect. - Vampiric Strike: Salar locks and steals the target's HP. - Kreln Shout: A powerful attack of soul-energy, causing magic damage over a moderate area. - Exile: Salar exiles an enemy and make him unable to deal or take physical damage. But the target will get extra damage from magic and spells. - Sacrid Sigil: Salar uses a mystic sigil which resists enemy magic and increases the magic resistance of all allies. - Ninja Strike: Teleports to the farthest enemy and deals melee damage, increasing attacks speed and attack damage bonus. The first hit definitely deals critical damage. - Fatal Dagger: Hurls multiple daggers and deals huge amounts of physical damage. This skill shares Ninja Assassin's 4th skill's critical effect. - Blur: Becomes hard to see by blurring his body and increasing dodge rate. Each successful dodge gains him extra energy. - Coup of Grace: Ninja Assassin refines his critical skills and increase critical strike damage. - Water Bubble: Selith traps a random enemy in a water bubble and causes him to lose HP over time, during which the enemy cannot cast any skills. - Energy Flare: Selith throws a water ball to a random enemy and deals magic damage. If the enemy cast ultimate skill, the water ball explodes and causes extra damage to him. - Enchanted Wave: Selith summons an enchanted wave and knocks enemies into the air, dealing magic damage and reducing their magic resistance. - Life Drain: Selith regenerates her HP while dealing magic damage. - Chilling Wave: Pallathion blasts out a wave of super-chilled air that freezes enemies before him. - Thermal Shock: A blast of ice and fire in unison deals magic damage to enemies twice. - Flame Strike: A blast of fire that can deal magic damage and burn enemies over a period of time. - Magma: A gout of liquid fire that causes magic damage to enemies, spreading out on contact with the ground. - Sun Burn: Isarus expels a huge beam of fire at the cost of his own HP, causing magic damage to enemies in front of him. - Supernova: When HP reaches zero, Isarus transforms into a burning ball that can be attacked by enemies. If it is destroyed within 5 seconds Isarus dies as well. However, if it survives for 5 seconds all enemies in range will be stunned and the phoenix will revive fully regenerated. (Isarus can revive 3 times in each battle and the ball can be destoryed after 4/3/2 attacks). - Isarus Charge: Isarus charges forward and deals magic damage to enemies ahead of him. - Flaming Bird: Isarus summons 4 flamming birds around him, increasing his attack damage and causing splash magic damage for 12 seconds. - Telson Strike: Alisa strike the nearest enemy with her telson, dealing magic damage and stunning him. If the enemy dies, it will cause extra AoE damage. - Toxic Smog: Alisa curls up and releases toxic smog, dealing AoE magic damage to nearby enemies, during which she receives reduced physical damage. - Venom: Each time Alisa receives a certain amount of damage, she spits out venom to slow down nearby enemies and dealing magic damage to them. - Resistant Skin: Alisa’s body is covered with poison, granting increased resistance to magic damage. - Dark Benefactor: Shadow Shaman sends a wave of shadow that cures allies. - Shadow Curse: Ara'ak reaches through the shadow void to poison an enemy. - Vayne's Blessing: Defends whichever ally has the lowest HP from death for a period of time. - Weave: Ara'ak fracture reality, bleeding into the shadow void, reducing the armor of all enemies. - Strategist: Saif silences all enemies' magic skills so that they can only deal physical damage. - Silence: Silences an enemy, preventing them from using skills accompanied with magic damage. - Befuddle: Saif befuddles enemies over an area to deal magic damage and make them lose energy. - Searing Aura: Saif's normal attack deals extra holy damage to an enemy. - Soulshout: Tala shouts across the ethereal plane, causing magic damage to all enemies. - Venomdar:Tala throws a blade covered in powerful venom and deals damage to a target over time. - Soul Blaze: Tala releases a potent scream, causing magic damage to enemies ahead of her. - Chaos Dance: Tala phases in and out of the mortal plane, easily dodging incoming damage. - Battle Focus: Sla'thrush inspires his allies, boosting their attack and movement speed by 25% and increasing attack and magic power. - Whirlwind Axe: Sla'thrush tosses 3 whirling axes and deals physical damage to enemies ahead of him. - Axe Skill: Sla'thrush uses his throwing axes as melee weapons to cause massive physical damage. - Battle Fever: Sla'thrush's battle fever gives him bonus attack speed. - Petrify: Nasira petrifies a group of enemies over a moderate area and deals magic damage. - Theft of Essence: Nasira summons a snake and steals energy from many enemies, increasing her own. - Anti-Mage Shield: A magical barrier that increases Nasira's HP. - Blood Pact: Kogo attacks with reckless charging, consuming his own HP and increasing his speed and attack power. - Sacrifice: Kogo enchants his spear with his own blood, causing a damage over time effect on the next target he strikes. - Gift: Kogo uses a sympathetic magic to heal the weakest ally and regenerate life for a period of time. - Spell Resistance: Kogo's patron spirits protect him and give him massive magic resistance.